The internet has changed our lives mostly for the good. However, there are some cases when we are forced to experience the ugly aspects of going online. Email scams are amongst those unfortunate experiences. So, what is an email scam? These attacks are usually linked to phishing or spoofing attacks. The attackers impersonate someone you know so they can blackmail you emotionally or fool you into sharing personal information. Your private information may include your social security number, credit card number, contact address, username and passwords, etc. Losing such information to hackers, snoopers or social engineers can have some dangerous consequences. To prevent your life from getting ruined by email scams, you need to take advance measures. However, before we move on to the advance measures, let’s talk about internet scams or email scams in more detail. Perhaps the most common yet highly successful online scam ever, the Nigerian scam involves a person from a wealthy Nigerian family asking for help with getting their money out of the country. The story follows a Nigerian prince’s email or the spouse who claims to have gained millions in fortune due to the recent death of her significant other. Now, the spouse wants to take the fortune out of the country but needs some outside help to get the job done. In return, the recipient or helper would get a good portion from the huge fortune. 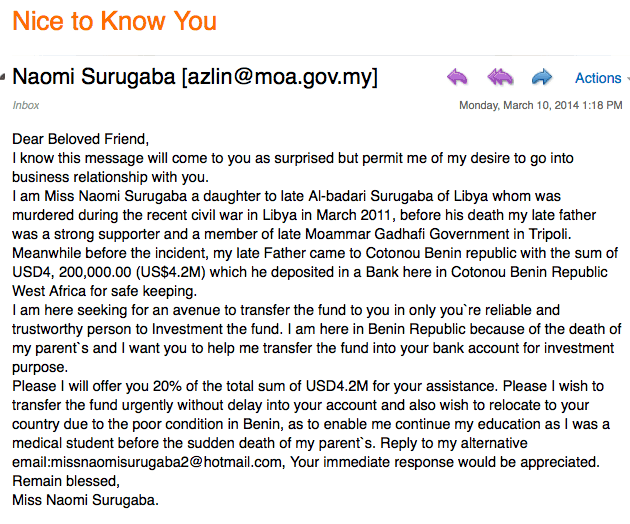 The email comes with a touch of emotional outcry for help that makes the recipients fall for the scam. 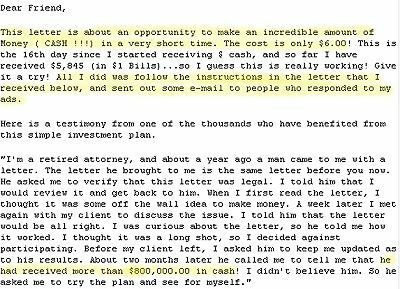 Also known as the chain-letter scam, the victim receives an email with the popular subject line, “Make Money Fast”, and are asked to add their name to the list. You are also asked to send $5 to the person whose name is at the top of the list. Everyone in the list contributes $5 and as per the email’s author, as the list gets bigger, the more money you get. Sometimes we wish to become a millionaire overnight but that’s only possible if you win a lottery. Yes, some people are lucky and they get to take home a big sum of money from lottery winning, but most of us are not. In fact, some people are so unlucky that they get scammed thinking they have won. Like any other scamming emails, a lottery scam email also comes with a convincing message that you have won a lottery. However, to avail the money, you need to pay the shipping/transfer fee, taxes, duty, etc. As humans, we tend to help those we see in distress. In fact, we would even go far to donate hundreds or thousands of dollars to help them. 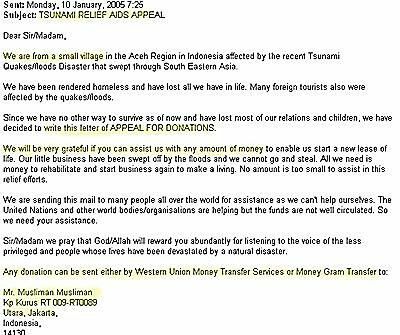 Natural disasters like Hurricane Irma and Mexico Earthquake are amongst those situations when people from all around the world would gladly send money to help the victims of the disaster. Such situations also give rise to disaster relief scammers who send scam emails in such situations, asking the recipient to help the victims by making donations. A secure job is the basic need of every man or woman and some of us would even pay to get work. 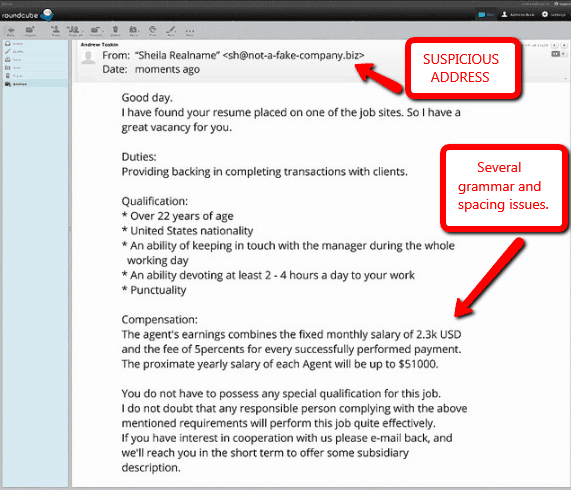 Internet scammers take advantage of this and scam them through fake employment emails. The recipient would require paying a certain amount to get the employment, which is usually a fake work-from-home opportunity. Phishing emails are becoming quite common and it is high-time that people start identifying such emails from just their subjects. So, the next time you get such emails in your inbox, you would know if an email is safe or scam. If it is a scam email, here are some ways you can block or report it. Formerly known as Hotmail, outlook is no different to other email clients when it comes to receiving scam emails. If you receive a scam email on outlook, don’t open it but check the box and click the dropdown arrow next to the Junk and click Phishing scam. Filter Spam – Make sure to mark each and every email as ‘spam’ whenever you see a suspicious one in your inbox. Don’t Trust Unsolicited Emails – This one is a no-brainer. If you don’t know the sender, there is no need to trust the email or the message within. 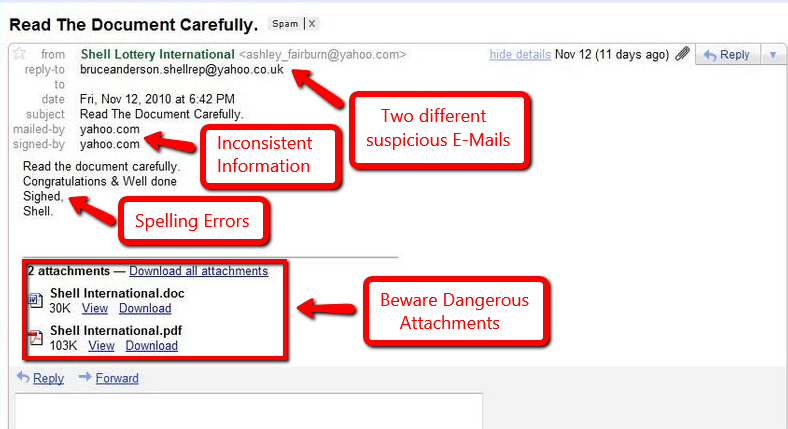 Treat Email Attachments With Caution – Be very, very careful with those attachments. At times, malicious attachments are received from people we know (due to viruses and other reasons on yours or their end). Don’t Click Links In Email Messages – This one is similar to the one above. By clicking a malicious link, you can have your internet device infected, or worst, you can lose control of your device. Install Security Software – Make sure you have the latest antivirus software and firewall installed on all your systems and devices. Updated Regularly – Keep all your security tools and applications and the OS updated. Be Cautious – Always stay cautious when it comes to checking incoming emails. Always check the sender’s name and the subject. Never Share Private Information – Never share your private details like your passwords, credit card number or PIN-codes with anyone. Not all emails lead to online scams. Majority of the scams also lead to different types of malware attack like ransomware attack or Trojans. Here are some effective ways PureVPN can help protect you from such attacks. PureVPN offers its users 256-bit AES encryption that makes an impenetrable tunnel through which all your data is transmitted. With the military-grade encryption protecting your network, nobody can listen in on what you do online. PureVPN advance features like the antimalware and antivirus protection allows you to block all kinds of malware or Trojan from ruining your device. Now, you can safely make online transactions or safe private data without worrying about any malware attack. The advance Intrusion Detection System and Intrusion Prevention System (IDS/IPS) offered by PureVPN helps you block all types of malicious traffic to your system in real time. Now, you can safely browse any website or download any file with complete peace of mind. Don’t let cheap scammers trick you into sharing your private information and ultimately ruining your life forever. Use the right measures today to fight email scams.